This Mummy Loves… is eight years old as of yesterday and I have literally just come across #Blogtober18 and loved the idea so much that I thought I’d give it a go. 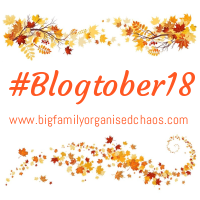 Firstly if like me you haven’t heard of #Blogtober before then it is basically writing a blog post everyday throughout October with prompts by Big Family Organised Chaos. Today is day 1 and the first prompt is ‘All About Me’ I’m actually really excited to join in with this as I’ve been feeling rather empty with regards to writing recently so this may just give me what I need to get my love back. My name is Sonia and I have just turned 41 years old. I have three children Liam who is almost 22, Boo who is almost 12 and Bugs who is 8 years old. I live with my other half James who I’ve been with for almost 15 years now. From a very early age all I wanted to do was be a midwife and have kids. Kids won and they have been my life for the past 22 years. My biggest regret in live will be not following my midwifery dream. I know there is still time for that but I really don’t have the money or support to go into full time education. I am currently studying to do my Maths GCSE next May, I didn’t pass it when I was at school and suddenly at the age of 41 decided it was time that I did. I hated Maths at school and didn’t put any effort in at all. But I am really loving it now and love the time I take out of being a mum to study. I am obsessed with having nice nails so get my nails done every 2-3 weeks. It is the one thing about myself that I take great pride in. I live in jeans and hoodies at the moment and wish that I had a personal stylist to dress me every day so that I looked amazing like some women just seem to be able to. Where does one learn that? lovely to meet you via Blogtober. Never say never about the midwifery goal. I think its phenomenal that you are doing GCSE maths now. I’m a big believer in there is always a way to achieve your dreams. You’re very brave taking your Maths GCSE again. I hated Maths as well and had to retake it when I went to college to get on to a childcare course I wanted to do. I don’t think I could face ever having to do it again! Good luck with your maths. First Blogtober for me. Yay! It’s fab that you are taking part in Blogtober! Congrats on the 8 years of blogging. That is fantastic that you are doing your Maths GCSE. My teen will be taking hers then too. Eek! I struggle to understand most of what she’s learning so good on you!